In an unassuming area of Somerville, Sarma is a breath of fresh air. Sarma is Boston chef Ana Sortun's latest creation. As a devout diner at Oleana and Sofra. This was a good combination of both. I was excited to learn that this was the second night of Spring menu. So exclusive! The meal started with warm lavash bread with a spicy olive oil. It was a welcome departure from the dinner roll. To drink, I enjoyed an Hermoso Ramo. Hot Dates: essentially warm medjool dates stuffed with an herb and goat cheese mixture, on a bed of rhubarb harissa. 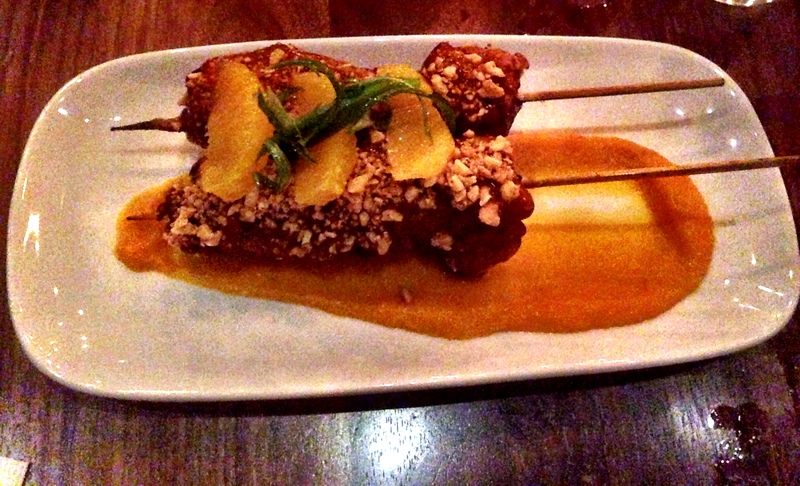 Given my affinity for devils on horseback, I had high expectations for this dish. However, while very tasty, it was not as mind-blowing as I had expected. Haloumi Fries. I would be more inclined to call these Haloumi "sticks" simply because they are much more reminiscent of a mozzarella stick than a fry. Anywho, these were delicious. Like grown-up mozzarella stick. In addition to the food, decor was very notable. Some of my favorite desserts in Boston are served at Oleana. However, Sarma is certainly lacking in the sweets department. Luckily, my belly was already content.